Depending on the nature of the disaster, you might be better off heading for your bug out location than staying put. But if you’re forced to go off-road and trek through the woods on foot, at some point you’ll have to set up camp for the night. Normally, camping in the woods is a safe and fun activity, but during a major disaster, it could be very dangerous due to the thousands of people pouring out of the city and into the countryside in order to escape the chaos of the cities and search for food and water. That is the main difference between regular camping and bug out camping. It entails several risks and challenges that you need to be prepared for. 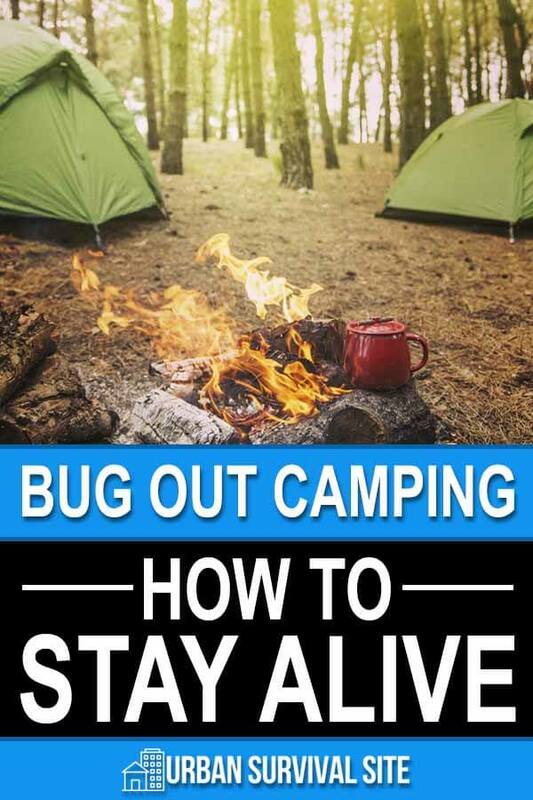 In this guide, we’ll take a closer look at the fundamentals of bug out camping and some tips and strategies you need to stay alive in the wilderness. Somewhere that is off the beaten path. You don’t want to set up at a traditional campsite, as these areas are almost certain to be too crowded to offer any real advantage over your urban home. Instead, you’ll be much better off camping the old-fashioned way, which means trekking deep into the wilderness and setting up your camp in an isolated location. Somewhere that offers access to resources such as firewood and water. The reason for this should be obvious. However, don’t set up camp too close to the water so you don’t get flooded. Somewhere with plenty of trees and bushes to block the wind and provide cover. If possible, find somewhere like this that also has a high point where you can see people coming from a distance. It might be hard to find a place with all of these features but do your best. I recommend scouting some areas that fit these criteria ahead of time, that way you’ll know exactly where to go the moment disaster strikes. Even if you are way off the beaten path in a well-hidden area, there’s still the risk that your campsite will draw unwanted visitors. This is especially true if you are building a fire or making noise. To help secure your campsite against intruders, you need to set up a perimeter. You can do this with equipment that you buy ahead of time such as motion sensor alarms and cameras, or you can improvise by creating tripwires that will cause cans to rattle, bottles to break, air horns to go off, and so on. However, I don’t recommend setting up perimeter defenses that would maim or kill someone who entered your camp–things like bear traps and pits. These Hollywood-style perimeter defenses take time to set up, are unreliable, and come with the risk of injuring you or someone in your camp if you forget their exact location. It’s also important to keep in mind that not every unwanted visitor is someone who wishes you harm. An innocent, well-meaning traveler could stumble upon the perimeter of your campsite while seeking shelter of their own. While even visitors such as this must be dealt with in some way, breaking their leg in a bear trap is probably not the best course of action. When setting up perimeter defenses, stick with ones that sound alarms so that you yourself are able to decide how much force the threat should be met with. Anything you leave behind at your campsite tells a story of when you were there, what resources you have, and where you might be now. While the risk of someone tracking you down may or may not be significant depending on where you are and how serious the disaster is, it’s still a risk you will want to prepare for by taking careful precautions when it comes to your waste disposal. Carrying your waste with you when you leave is the most surefire way to prevent it being found by someone who would do you harm. However, for obvious reasons, this may not be ideal. Short of taking your waste with you, the best way to dispose of it so that it will not be found is to bury it a good distance away from your campsite and cover it fresh dirt, brush, and leaves so that it is not obvious something has been buried there. And do I have to state the obvious? Okay, I will. Don’t leave a single piece of trash behind. You shouldn’t be doing this anyway. Fire is a necessity for survival when it comes to bug out camping. However, fire also comes with a couple of serious risks. The first risk is one you must deal with no matter what type of camping you are doing – the risk of setting your campsite ablaze. Clear the area around your fire and build a fire pit with rocks to reduce the risk that your fire gets out of control. When you are bug out camping, fire comes with a second, arguably more serious risk: alerting others in the area of your campsite. Where there’s fire there’s smoke, and smoke can often be seen from miles away. Likewise, charred logs and ashes are evidence that someone was there recently. To reduce the risk of someone locating you or your campsite because of your fire, there are a few precautions that you can take. Don’t build your fire any larger than necessary to keep warm or heat your food. Only burn wood that is dead and dry as green or wet wood gives off much more smoke. Avoid burning logs that are larger than your wrist as larger logs rarely burn up all the way. Build a stealth fire pit, which won’t put out as much light at nighttime as a regular fire would. When you’re ready to go, be sure to put it out the correct way. Drown the last of it with water, stir up the ash and embers, scrape off the burnt wood, add some more water, and make sure the heat is completely gone. If not, repeat the process. Campers should do this anyway to ensure they don’t inadvertently start a forest fire. The wildlife in the area that you are camping in can present opportunities for food as well as risks, making it important for you to know what other creatures may be calling your campsite home. Poisonous snakes and spiders must be watched for when you are walking around or picking up firewood, and you also need to be aware of large predators such as bears, wolves, and mountain lions as well. While attacks from large predators such as these are rare, they become less rare when humans start invading their territory such as you will be when bug out camping at a wilderness location. This is where your perimeter alarms become valuable again, as they are able to alert you to the presence of a four-legged threat as well as a two-legged one. If there is small game in your area such as rabbits or squirrels, you can set traps to gather food, or if you are near a stream with fish in it, you can easily craft a fishing pole and use worms or other insects as bait. In more ways than one, having knowledge of the wildlife in your area can help keep you alive when bug out camping. Don’t stay at your camp for too long. You might be tempted to sleep in late or sit around the fire for a bit after breakfast, but it’s important that you get to your bug out location as quickly as possible. The longer you sit around, the more likely you are to cross paths with dangerous people. Bug out campers should also be aware that smoke from night time campfires can be easily spotted the next morning. As temperatures drop at night, an atmospheric thermal layer can develop that causes smoke to collect at relatively low altitudes (one or two hundred feet above ground). If there is no wind, the smoke basically hangs over the point of origin. You may not be able to see it, but anyone with a clear line of sight can see the smoke and, thus, know where your camp is located. The best advice is to avoid wood fires unless absolutely necessary. Dakota Fire Holes can generate enough heat to significantly reduce smoke, provided that you are using thoroughly dry, small diameter material. Otherwise, use propane or similar fuels for cooking. If you can set a camp in a location where there is a steady overnight wind, the problem of smoke is greatly diminished. Ideally, your camp/cooking fire should be concealed from all angles, including vertical. absolutely dig a “Dakota Fire hole” this will hide your fire and if you dig it under some trees it will break up the smoke column too. Have fire a little as possible. And remember just how far cooking food smells carry. Try to have foods that only require hot water or can be eaten cold. Burry all trash deep and well camouflaged. same goes for waste. Use cat hole and not a open slit trench. Be sure that you tent / tarp is a color that blends in and break out the out line with brush. Might be a good reason to have a camouflaged tarp to cover the tent. Try not to leave trails use a different rout every time you leave camp and return.